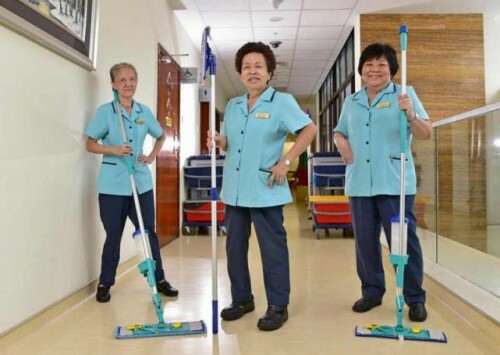 The senior housekeeper, who has spent more than half a century cleaning the private hospital in Thomson Road, is its longest-serving staff member. Her late father was a cook at the hospital, which was set up in 1961, and he recommended his then 19-year-old daughter as a housekeeper in 1962. She and three other housekeepers - who have each worked at the hospital for 45 years - are a rarity in today's job market, where change is relentless and disruption the new reality. This is especially so for the cleaning industry, in which a cleaner who stays with the same firm for 10 years is deemed extraordinary, said Mr Milton Ng, president of the Environmental Management Association of Singapore. The median basic wage of Singapore's full-time cleaners was $1,100 in 2015. Mr Woon said cleaning firms usually give cleaners between seven and 14 days of leave a year. He added that after working for 30 to 40 years, cleaners still earn less than $2,000 a month. Their low wages are the reason the labour movement's Tripartite Cluster for Cleaners has pushed for higher pay. From July this year, the basic pay of cleaners hired by cleaning firms will rise by $200 over three years. After that, it will rise yearly by 3 per cent for three years. The Mount Alvernia housekeepers plan to work for as long as they can. They work six days a week, for eight hours a shift. Madam Wong's husband, retired technician Loy Jit Tuen, 73, said: "I have told her to retire but she wants to work. We don't need the money. We have savings." The housekeepers said cleaning methods and materials have changed over the decades. For example, in the 1960s and 1970s, they had to go on their knees to scrub the floor. Now, they handle a machine that does the scrubbing, which is less tiring for them.